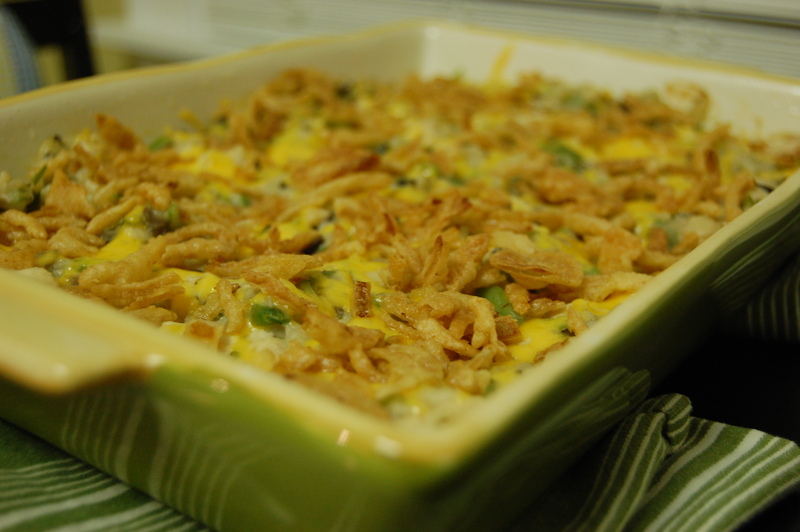 Green Bean Casserole: you either love or you hate it. I love it and think that it is a shame that it only shows up once a year, usually on the Thanksgiving dinner table. 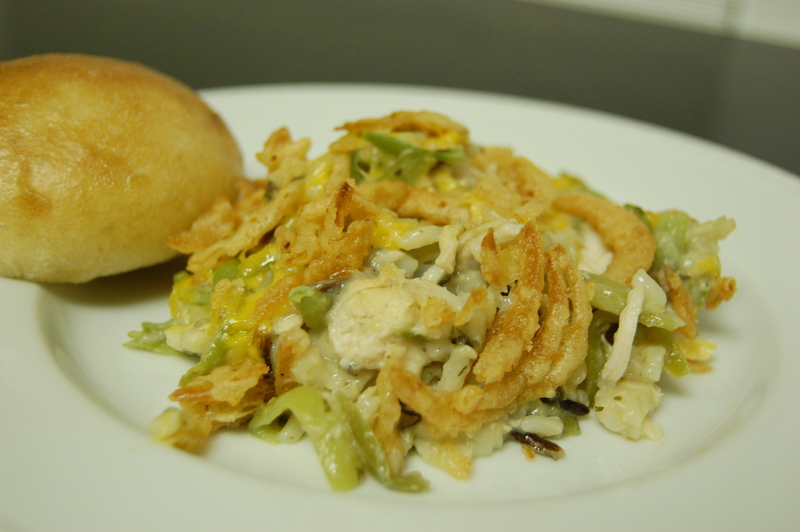 I just love the flavor, the green beans and the crunch of the French fried Onions. Mmmmmm. Because I miss this casserole almost year round, I decided to try and jazz it up in order to create a recipe that is similar but is something I could eat on days other than Turkey Day. 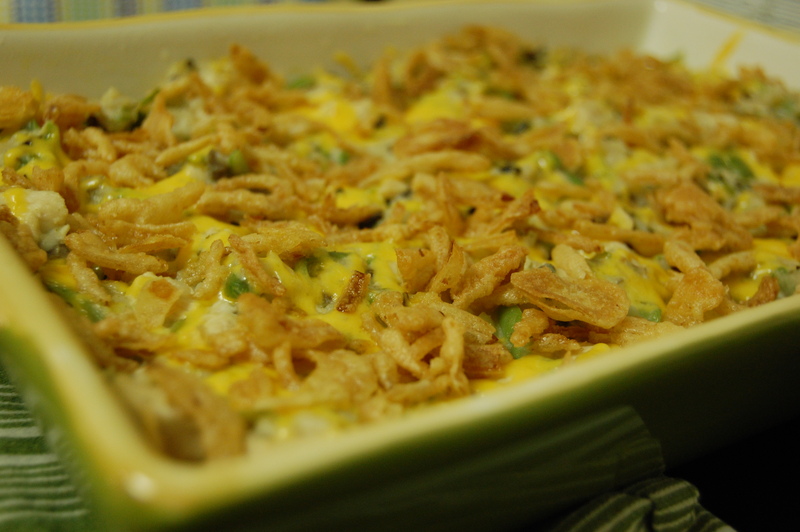 I simply took the basic Green Bean Casserole recipe and added chicken, rice and a sprinkle of cheese. I must say it was delicious and left my husband and daughter asking for seconds. Depending on the size of your family, this recipe can make either one large casserole or two smaller ones. It freezes very well if you decide to make two! Preheat your oven to 350 degrees. In a large bowl, combine the cooked rice, the cooked chicken, the frozen green beans and the soup. Stir until combined. Butter a large casserole dish (or 2 smaller ones if you prefer). Place the green bean mixture into the pan and sprinkle with the cheese. Cover with foil and bake at 350 for about 30 minutes or until heated through. Remove from the oven, uncover, sprinkle with the French fried onions and bake an additional 5 minutes until the onions are golden and crisp. Making this for dinner tomorrow!!! I make Green Bean Casserole a few times a year – It is an easy dinner for two and the leftovers are sooo good!! I just roasted two chickens and have lots of leftover chicken … will be making this recipe this weekend! I’m so excited it’s the time of year for comfort food!